A picture, as we know, says more than 100 words–or is it 1000? And it seems that rendering events or histories pictoral is an intrinsic part of what makes us human. 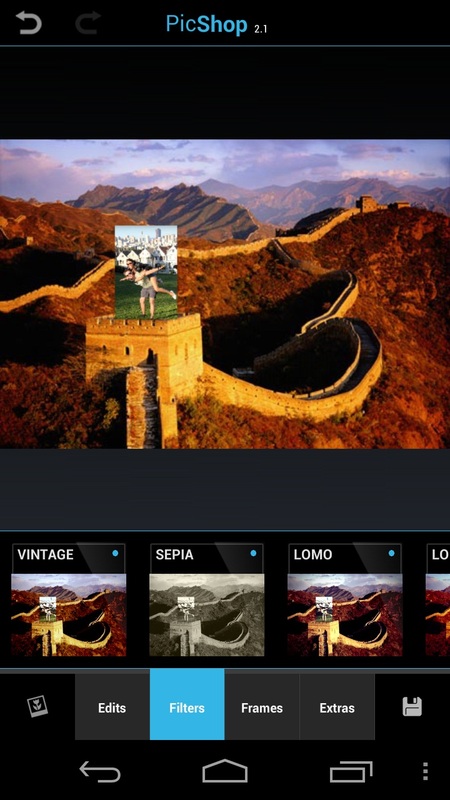 So from prehistoric cave paintings to Instagram et al, let's check out PicShop - Photo Editor, an application that will help smartphone users with editing and post-production on their photos. There are tons of options for camera apps out there, but only a handful seem like full blown all-rounders. As much as I've whined about Instagram and privacy polemics since it was acquired by Facebook, I must admit that its concept was great at the time: it identified a gap in the market and established a niche for itself. That said, Instagram can't do much more than provide users with nice effects and the option to share images via its own social network. 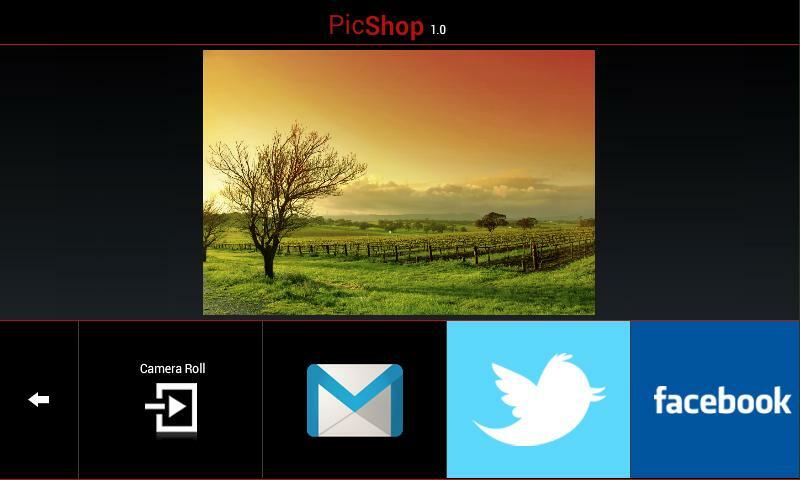 PicShop can use images from any source (new shots, gallery, Facebook, etc. ), save Google+ and Picasa to which the app does not yet have access. Brightness and contrast can be adapted, and the app also harbours a great tool for making detailed corrections. Other effects such as fish eye, tilt & shift and focal point are equally available, and can be manipulated according to which degree you wish for an effect to, well, come into effect. Red eye correction is also available, as is an easy to use undo / redo tool. The app features all of the standard filters you may know from having used other photo tool apps: LOMO to Vintage to Vignette to Super Rich—there are 18 different filters to choose from in total. But the great thing about PicShop as that users can decide to which degree they wish for an effect to be applied to an image. There are no options for creating one's own filters or for downloading new ones from the market. There are 20 frames to choose from, ranging from classic to fun frames and polaroid frames. 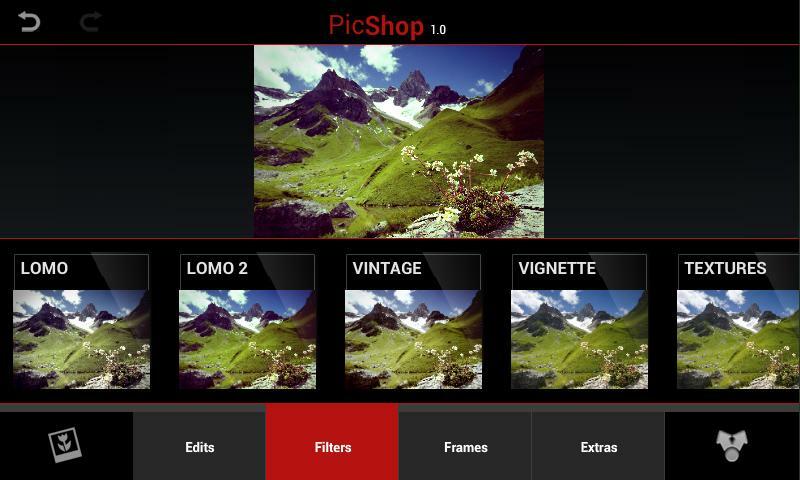 PicShop - Photo Editor offers a lot of extras. Adding more image layers is not a problem. The text tool and meme maker are also easy to use and fun options for personalising an image. There are lots of speech bubbles and stickers to rummage through and help turn boring family portraits into cringe-worthy family favourites. A drawing tool also comes with the app. All images can be saved (8 Megapixel resolution) and they can also be shared using the integrated share button. PicShop - Photo Editor is a great camera and editing app because not only is it easy to use, it's also conveniently an all-rounder. We would love to see an option for exporting from Google+ and Picasa in the future, so let's keep our fingers crossed for that! Using PicShop - Photo Editor is pleasure because it is so simple. When I first got to know the app and saw how nice and easy photo editing controls can be, I couldn't help but wonder why no one else had come up with a similar concept prior to the good folks over at esDot. The image takes up most of the display surface. Beneath it you will find a selection field for all filter options, frames and extras. Once you're done with editing an image, hit the share button if ever you're inclined to show the world what you've come up with. 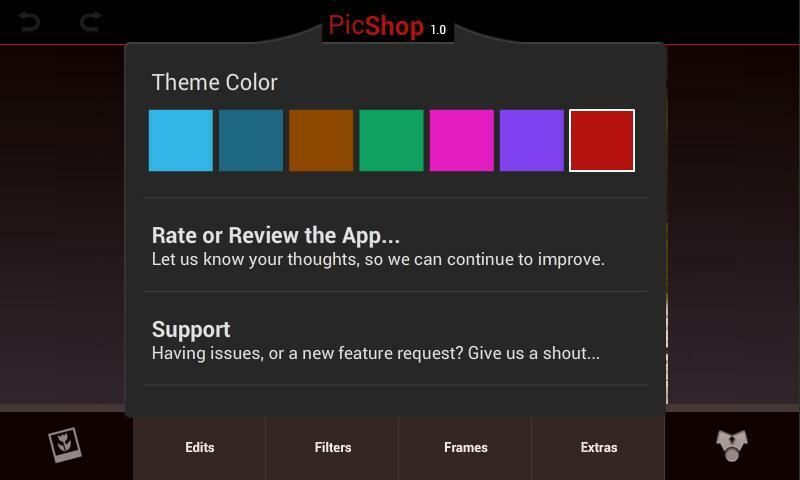 PicShop also comes with several colour themes, meaning you can switch from blue to something else should it not be to your liking. My favourite aspect: PicShop does without an integrated menu button. Controls are so well thought out that the app quite simpl doesn't need one. No complaints here—on the Galaxy Nexus PicShop - Photo Editor performed well in the speed and stability departments. A quad-core device is by no means a prerequisite for achieving fast photo editing results, mind. 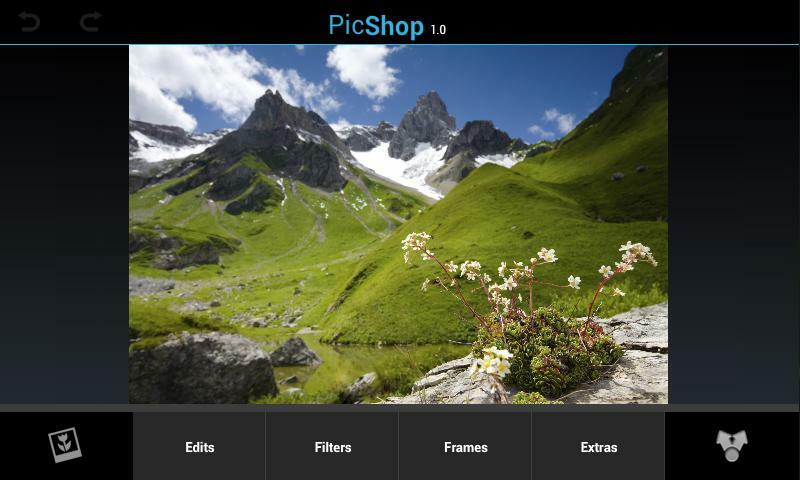 PicShop - Photo Editor can be found in the AndroidPIT App Center and costs EUR 3.98, which we find to be a fair price for an app that provides users with so many effects and in which the concept behind the controls is so brilliantly thought out. As our app of the week, PicShop is available for only EUR 1.99 for a limited time only. It's exactly the application I need: simple, intuitive interface, quick effects and ... it's cheap! so l want you to write back to me through my Email Box ok,PLEASE CONTACT ME DIRECTLY WITH THIS EMAIL(jonesbella19@yahoo.com)So that l will give you my picture and for you to know who l am.hope to see your mail OK.
aw, happy to hear it!